Growing up as a western New York native in the mid-1980s, I felt an overwhelming sense of togetherness and belonging that at times now seems missing in Rochester, and in larger society as well. With that in mind, the Roc the Peace fest — for the past five years — has become a key event for the community, drawing residents and groups from all economic walks and ethnicities, fostering goodwill and a commitment to nonviolence. Designed to bring awareness and resources to victims of violence, Roc the Peace began in earnest in response to a mother, Sirena Cotton, losing two sons to street violence. Cotton saw the value in bringing together mutually invested community groups and leaders to address a larger common interest; a common need. ROC The Peace and Rise Up Rochester announces the staging of the 6th Annual Rise Up & ROC The Peace Fest to be held on Saturday, July 18, 2015, at Jones Square Park in Rochester, New York. Designed to bring awareness and resources to victims of violence and their families, this event is in direct response to a grossly disproportionate level of violence in the past few years. A day long event in the heart of the city, various community groups will be on hand presenting opportunities for educational enrollment, vocational training, free food and more. The chief of police and past and present Mayors have been regular attendees. 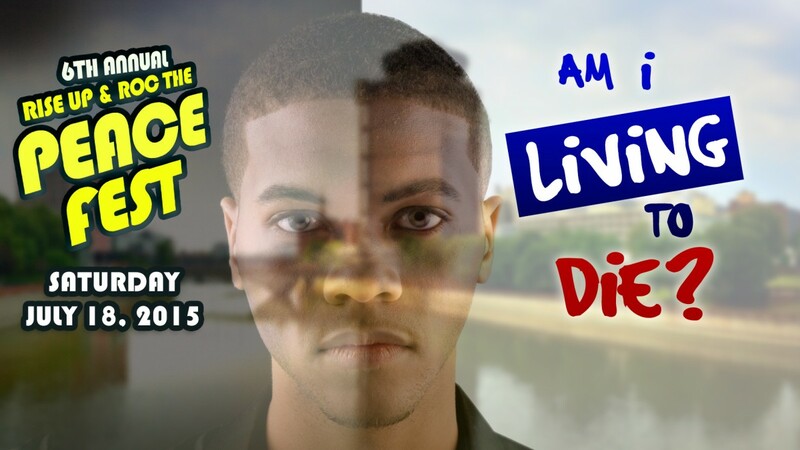 Featuring events for the whole family, including speakers, singers,poets and dancers, this year’s keynote speaker is Amen Ptah and features national recording artist HEXX. In addition, ROC The Peace was started by Sirena Cotton in 2008, a year after she lost her 16­yr old son to a senseless murder in Rochester. To honor her son’s memory, Cotton started a rally called ‘Peace for Chris Fest’ which was later renamed ‘Roc the Peace’ to honor all victims of any type of inner­-city violence. Cotton later partnered with Rise Up Rochester, Incorporated, a 501c3 nonprofit that empowers the community to establish and maintain a nonviolent culture and provides support to crime victims and their families. Today is not only a day to celebrate our country’s independence, but the first day Roc The Peace launches it’s online multi-video “I am ROC Happy” campaign. 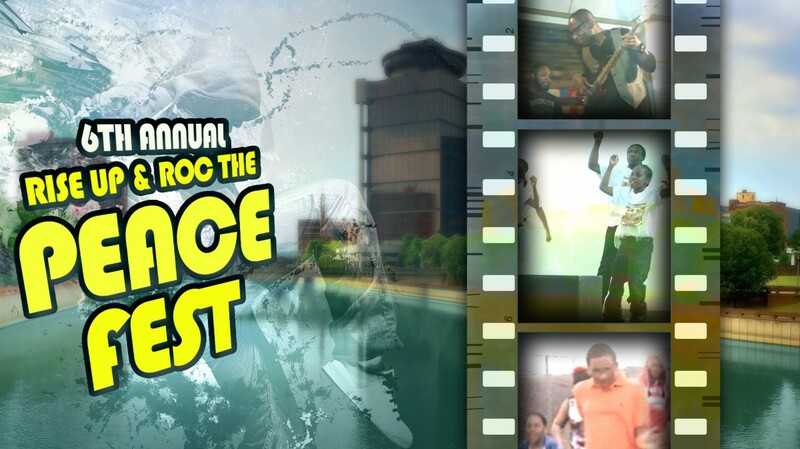 The campaign is aimed to help restore pride in Rochester, New York while promoting the 5th Annual Rise Up and Roc The Peace Fest scheduled to kick off on Saturday, July 19, 2014. “Happy” is an award-winning hit single from producer and pop artist Pharrell Williams. The infectious tune has attracted people of all cultures, capturing the top spot in over 20 countries worldwide. People all over have mimicked the music video, featuring common, “everyday” people walking to the tune. 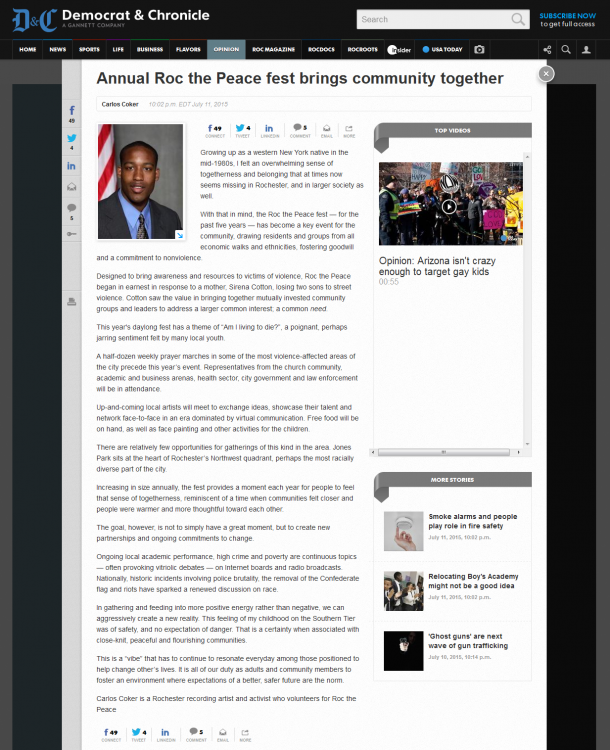 Roc The Peace’s rendition is no different, only customizing it to feature various areas of greater Rochester, New York. 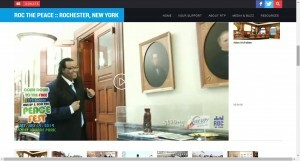 The videos feature volunteers of all ages, dancing, skating, walking, smiling with the idea that Rochester is made to live. “Your smallest contributions make a world of difference to your loved ones and to complete strangers,” explains Rochester native Tone Williams, a volunteer for ROC The Peace. “We are committed to restoring hope and pride in an effort to curb violence in our city.” The campaign is designed to inspire others to become more positively involved with the community and the successful turnout demonstrates the effectiveness of the creative effort. ROC The Peace is an organization founded by Sirena Cotton, after her 16 year old son, Christopher Jones, was gunned down outside of his home in Rochester in 2007. Jones marked Rochester’s 52nd homicide that year. Since then, the name of the function has changed but the mission has not: to curb inner-city violence. Cotton is working diligently with other organizations such as Rise Up Rochester, a non-profit organization geared to uplift the city. 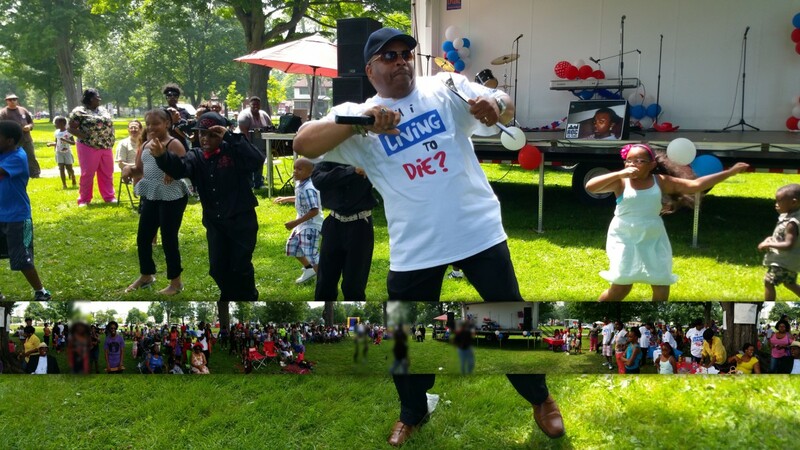 The 5th Annual Rise Up and Roc The Peace Fest will be staged on July 19th 2014, 12 PM at Jones Square Park. This year’s keynote speaker will be Hon Mayor Lovely Warren along with a performance by Michael Burton, 2014 Roc Awards winner for Best Male Gospel Artist. An afternoon lineup of local talent will showcase to include rap, poetry, dance, vocal artist comedians and more. As joint partners, Rise Up Rochester and ROC The Peace expect a record turnout this year and have prepared food, games, prizes and much more for this family oriented event. ROC The Peace is in part Toneee.com (web development, graphic design and social media marketing), Setting The Tone (marketing and project management), CROCK AV STUDIO (filming and production) and 12 Parks Studios (production). The “Happy” videos and more information regarding this year’s festival are available at rocthepeace.org/happy. Roc the Peace (rocthepeace.org) will be recording a citywide music video to raise awareness of its cause alongside Rise Up Rochester (riseuprochester.net) and Setting The Tone, from April 7-11, 2014. The video will use an award-winning single “Happy”, written and produced by national recording artist and producer Pharrell Williams. The single is already an Internet sensation with millions of views, especially since the launch of Williams’ website, 24hoursofhappy.com. Dubbed “I AM ROC HAPPY”, the video will mimic the official music video and feature the song repeatedly using seemingly everyday people. This version will use residents of Rochester almost exclusively. The video is slated to film in popular neighborhoods and government buildings and small businesses such as City Hall, Avenue D Recreation Center and Unkl Moe’s Restaurant from Monday, April 7 through Friday, April 11, 2014. Those interested in performing on-camera are encouraged to complete the online application available at bit.ly/roc-happy-app. Aside from Roc The Peace, Rise Up Rochester has been busy in the community offering partnerships geared towards a number of areas. The below list a few other partners. Every year, hundreds of lives are changed forever due to the violence here in Rochester, New York. In fact, prior to 2013, Rochester enjoyed four years of near-record lows in all crimes. We believe this is partially due to community outreach and awareness programs such as our annual event.